The strengths of families from culture to culture, when compared to each other, are remarkably similar and give us common ground around the world upon which to unite and develop mutual understanding. Strengths-Based Research and Perspectives: Strong Families Around the World, provides a conceptual framework for global family strengths, discussing the diverse strengths and challenges that families face regardless of location. This book presents 43 expert authors from 18 countries in all seven major areas in the world who explain what it means to be a family in the context of their country and the challenges their country faces in the world today. Focusing on the latest studies of similarities between strong families of different cultures, Strengths-Based Research and Perspectives: Strong Families Around the World presents a wide variety of disciplines, including family studies, family education, family therapy, modern languages, psychology, social work, sociology, cultural anthropology, and nursing. This insightful text centers on the Family Strengths Perspective, a paradigm that not only recognizes that there are problems in families today, but demonstrates clearly how these can be dealt with successfully. This valuable resource provides case study examples, quotations from literature and cultural mythology, tables, figures, and extensive references to give readers an in-depth understanding of the issues from strengths-based perspectives. 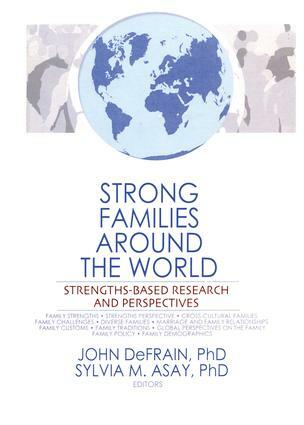 Strengths-Based Research and Perspectives: Strong Families Around the World is useful as a text in marriage and family relationships classes, cross-cultural family patterns classes, strengths-based practitioner training classes, and family therapy and family educator training classes. This valuable resource will also be of great interest to family educators, family therapists, psychologists, social workers, nurses, and religious counselors.